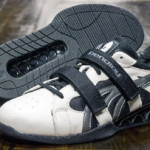 The Pendlay Do Win is one of the most standout lifting shoes on the market. 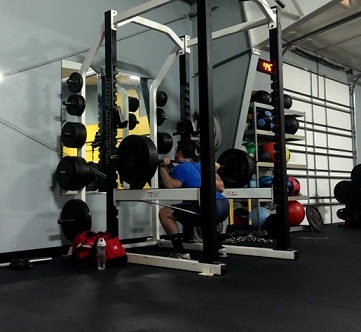 The Do-win is built for weightlifting performance, and great for any kind of lifting from squats to olympic lifts. Pendlay is an established weightlifting company that also manufactures weights and other lifting equipment, giving them a very unique presence when it comes to weightlifting. 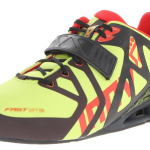 This is an unusual quality for a lifting shoe to have, and I like it a lot. High-quality materials make for a better shoe and shows that they are putting some effort into having the shoe strong as well as flexible. 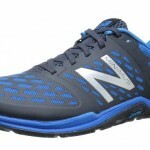 Leather definitely is not a common material among lifting shoes, which is a nice point in the favor of the do-win. I could see this pair of shoes outlasting a lot of what is out there on the market because they just don’t offer the same leather construction as these. 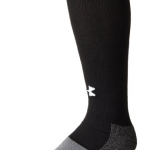 A little bit taller than the standard height of a raised heel for a lifting shoe, and a nice height to help deal with poor ankle mobility and a solid base to drive from. 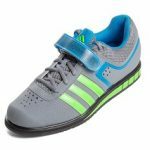 When looking for a shoe for for the gym you probably want a raised heel over a flat one to help you achieve squat depth and help form on Olympic lifts. If you struggle with ankle flexibility it is always a good idea to work on that separately as well. I am always a fan of the two straps for a lifting shoe to totally secure your foot in place so you don’t have to worry about a movement of any kind within the shoe. It’s a less common feature in shoes and I’m surprised by that because it seems so obvious to improve. But maybe that’s just my personal preference speaking. Your feet will not be going anywhere in these! Most people report that the shoe is wide, which is a good thing for weightlifting of any kind. However, the manufacturer even reports on the Amazon page that the recommended fit is a ½ size down from your normal shoe size. 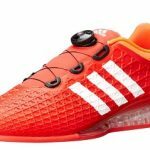 Which is probably to ensure that it’s a snug fit as most lifting shoes want to minimize your foot moving within the shoe. 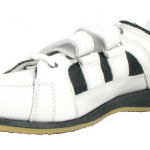 However, if your feet are really wide you might want to keep it at your regular shoe size. Also good to note, is this a re-design of the 2007 model, with significant improvements to the flexibility of the sole and construction of the shoe. As you can see they have a very wide toe box. Possibly one of the widest I’ve seen and I like it a lot because of that. You are probably wondering why it looks like a monstrosity compared to most lifting shoes, aren’t you? The purpose of it is to distribute the weight over a larger surface to “spread the floor” so to speak and really goes to show the knowledge that was put into the design of the shoe. 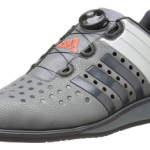 This is an excellent weightlifting shoe. If you are looking to get serious about your training and want a solid shoe, I highly recommend them. The materials they use are higher quality than most lifting shoes and the features are everything I would expect a lifting shoe to have. I think the Pendlay Do Win makes for a great choice for pretty much anyone. The price is right, and Pendlay is a well-known reputable brand. They will even ship you a replacement at no cost if your sizing is wrong and you send the shoes back, which is always great and a solid sign of good customer service. That kind of support is very hard to come by these days and speaks a lot to the company’s focus on keeping customers happy. You would find it hard to find another company with such nice return policies, however, if ordering from Amazon that is even less of an issue. It’s hard to go wrong with the Do Win!